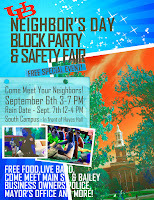 This Sunday September 6th join your neighbors and friends at the Neighbor's Day Block Party to be held on the UB South Campus. This is a free special event designed to bring together residents of the University Heights, Main Street and Bailey Avenue Businesses, and city, county and university offices. It will be from 3:00pm - 7:00pm on the lawn in front of Hayes Hall. There will be free food, a live band, informational tables from local organizations and more. Students and neighbors are invited. A rain date will be on Monday September 7th from 3:00-7:00pm. For more information about the event please contact the UB Office of Off Campus Student Services at 829-3541.